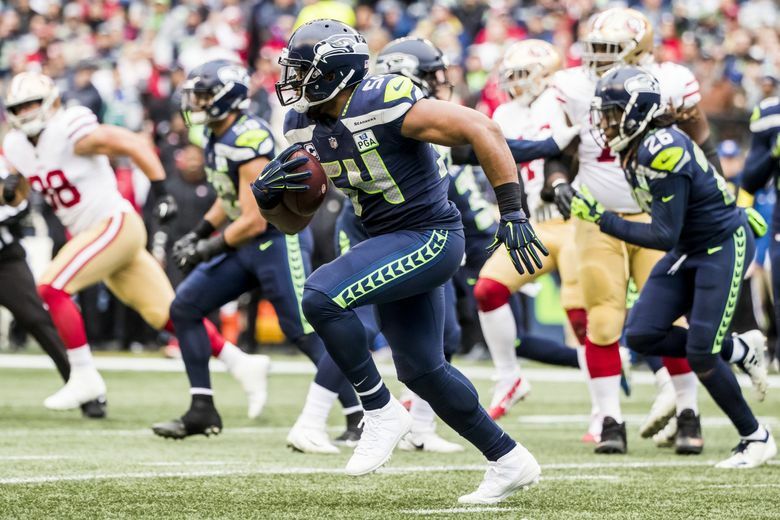 In the Seahawks' win over the 49ers, linebacker Bobby Wagner finished with 12 tackles, two quarterback hits, two tackles for loss, two passes defended, one interception, one sack, one forced fumble, one fumble recovery, one touchdown, one nap and one date with an oxygen tank. Bobby Wagner needed a nap. And a whole lot of oxygen. Those are side effects associated with the longest interception return in Seattle Seahawks history. The play began with 4:21 left in the fourth quarter Sunday, at the Seahawks’ 5-yard line. Rookie San Francisco quarterback Nick Mullens took a shotgun snap, felt phantom pressure and lofted a pass off his back foot over the middle, in the general direction of running back Jeff Wilson Jr.
Wagner didn’t get caught. He didn’t even get touched. The seventh-year Seahawk stepped in front of the route, snared the football with both hands and took off down the right sideline. He did see Mullens, who was making a desperate, dogged pursuit and nearly caught him at the 50-yard line. Had he needed to, was the 245-pound Wagner prepared to juke? His arms pumped, his heavy legs lifted and Wagner mercifully arrived, lumbering 98 yards into the end zone, flanked by a trail of teammates. It was the first pick-six of his life in his seventh NFL season. It was a 13-second jaunt that probably felt like 50 years. And when, exactly, was the last time Wagner can remember sprinting 98 yards? “Never,” he said, after taking a second to think it over. So, perhaps appropriately, Wagner slept. He lumbered to the back of the end zone, dropped the football on the turf and napped on it like a pillow. The cheers of more than 69,000 fans at CenturyLink Field couldn’t disrupt his deserved slumber. This was not a planned performance, like the Seahawks’ wide receivers pump out with each passing touchdown. It wasn’t some symbolic statement on the perception of this new-look Seahawks’ defense, either. It was a desperate decision, a winded Seahawk’s last resort. In the wake of Sunday’s 43-16 win, it would be difficult to find anybody sleeping on Wagner. The four-time Pro Bowler finished with 12 tackles, two quarterback hits, two tackles for loss, two passes defended, one interception, one sack, one forced fumble, one fumble recovery, one touchdown, one nap and one date with an oxygen tank. That supposedly inarguable assertion is made even more impressive when you consider his unproven supporting cast. Wagner has continued to excel without K.J. Wright, without Kam Chancellor, without Michael Bennett and Cliff Avril. And, as Wagner noted, Sherman was standing somewhere out of sight on the opposite sideline. But somehow, some way, the Seahawks are 7-5, with a wild-card berth firmly within reach. Like Wagner’s resilient 98-yard romp, the Seahawks have a clear path. Their competition is fading, and the playoffs are looming. All they have to do now is finish.